Well, there was no Peterhead away game today, sadly, after a morning pitch inspection at Balmoor confirmed the worst. The freeze strikes once more. 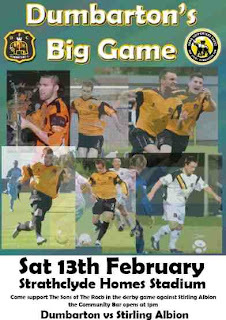 But hopefully the Mighty DFC will be in action at Methil against East Fife next Saturday, pushing for the play-offs. Then it's a run of two home games on successive weekends. Top 'o the pile contenders Stirling Albion are first up, followed by bottom o' the mat strugglers Clyde -- the latter tussle being the one where I'm due to be Match Ball Sponsor to celebrate 40 years as a Sons fan. The actual anniversary was 13 December last year, but due to climactic conditions the party got pooped. I have my fingers crossed that I might be able to get a few matches in during March as well, when a number of postponed games are due be re-scheduled. I need to be in Scotland for the civil partnership of some friends of ours early in the month, plus I have a number of work-related people to see in Glasgow and Edinburgh... so if Sons end up with fixtures either on the 9th or the 30th (my birthday), I'll be a happy man, other factors willing. If you don’t support one of the Premier League ‘big boys’ there’s a piece of conventional football observer wisdom that says it’s often better to be involved in a promotion chase in a lower league than a survival scrap in the one above. Try telling that one to Exeter City fans after the last couple of weeks! The word ‘Leeds’ is likely to be among the first thrown back at you – and in any case, the Grecians aren’t easily admitting that the bottom of the table is on their minds. Boring it has not been. It’s now a fortnight since that incredible 2-0 victory over the mighty men from Elland Road, and while we now have more to chew on following the away derby defeat at Yeovil, the aura of that famous victory still understandably lingers around St James Park. I rather imagine that the gaffer has been saying something similar to his players in recent days! Indeed, in his post match interview, while still relishing the Leeds triumph, Paul Tisdale was quick to point out that it was “only three points”, hard as that is to credit when you topple the side that only recently beat Manchester United in the FA Cup. This afternoon, by contrast, I predict a tough game – but would be happy to be proved wrong with a convincing and large victory. However, Carlisle United visit the southwest today buoyed by a few boosters themselves. The fact that they also managed to beat a certain Leeds, for example. They won 2-1 at Elland Road (no less) in the Johnstone's Paint Trophy. Likewise, though they are just below Exeter in League One, the Cumbrians have games in hand, and will be keen to avenge themselves of the 1-0 defeat to the Grecians at Brunton Park back on 22 August last year. That day it was a 73rd minute penalty from Marcus Stewart that separated the two teams. Much has changed since then, of course. But Exeter City still sometimes give the appearance of bringing out their best performances against a few of the strongest teams, while letting goals and points slip in the lower zone of the table. It will be a clear New Year’s resolution on Well Street to ensure that the kind of weaknesses that contribute to this pattern are ironed out, and this game is as good as any to prove that. An added impetus for City this afternoon is the knowledge that there are some demanding fixtures just around the corner. Next weekend the boys take on Milton Keynes Dons, who are pushing hard for the play-offs. Then it’s Southampton at home – another game that’s sure to attract a large crowd. Hopefully, I will be able to make that match, as I am down in Devon from my new home in Birmingham over the weekend. Hardly will Exeter have had a chance to capture their breath from tackling the Saints than a trip to the New Den to face Millwall hoves into view on 13th February (that’s Saturday, not Friday! )… followed by two home matches in quick succession on the 20th and 23rd, concluding with an end-of-the-month trip to the seaside to take on Brighton. Hopefully that fixture bundle gives a fair idea of just how resilient the Grecians and their supporters will need to be in the second half of the season. A good result this evening would be a fine start to the journey. Well, OK, not strictly a volley... but a free kick just outside the post from Leyton Orient at Chartlon Athletic tonight. The Os won 1-0. They are the first team to win against the Addicks at home this season in League One. It was a pulsating game - end to end, though sometimes lacking in quality finishing. The scorer, from a diving header 7 minutes into the second half, was Scott McGleish. This is a regular feature in Sons View. My questionnaire appeared in the joint issue for the Alloa and Stenhousemuir home games in December 2009, but, since they were both postponed, was actually issued along with the Cowedenbeath programme on 23/01/01. Age: 51 and a half (or better still, a pint). Profession: Hack, occasional academic, joint owner of a think-tank. How long have you supported Dumbarton? 40 years last month (I saw the light on 13 December 1969). 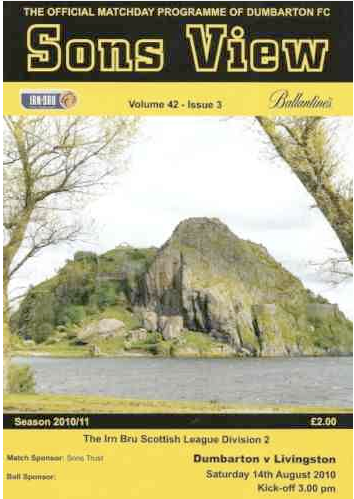 Why do you support Dumbarton? My mother had distant relatives in Ayrshire, and I followed the Scottish results because I liked the team names. Then, aged eleven, I suddenly decided to throw my lot in with Sons, after they’d lost 6-1 to Stranraer. My parents thought I was bonkers – which only confirmed the rightness of my choice! The rest is history. Best thing about supporting Dumbarton: The fans, the Trust, and the sheer confusion it causes my fellow Sassenachs. Do you support any other teams and if so why? Sons have my sole abiding loyalty, but I maintain an interest in local sides, most recently Exeter City. I also want Burnley to thrive because of Owen Coyle and their defiance of the EPL establishment. (1) My late mother and I supported Scotland, my father England. I’ve maintained that tradition. My favourite numbers are therefore 3, 2 and 1967.
Who do you usually go to games with? Tim, Margot and Toby Rhead when they are around. I get to three or four Sons games a season. If I was richer and nearer it would be many more. Where do you see the Sons in five years time? Saying “thanks, but no thanks” to the SPL, having won the Division One championship, turned down a madcap ground relocation, and secured a regular attendance of 1,700 at SHS. First game you went to: Frustratingly, I can’t recall. It was very early 80s, after I stopped being a broke student and got a proper(ish) job. Favourite goal you’ve watched Sons score: Easy. Peter Houston on 5 September 1987 against Hamilton. 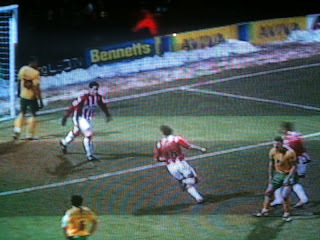 We lost, but it was the first time I’d seen Dumbarton hit the net after numerous trips. I went nuts and people on the terrace thought I was mad. They were right, but did I care? 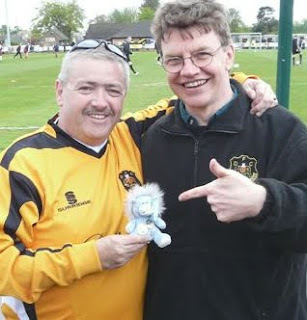 Favourite player (past): Laurie Williams – a goalkeeping legend, plus he bought me a drink recently. So I’m hoping this citation will turn out to be a voucher. Favourite player (present): Cheating again, it’s a dead heat between Ben Gordon, because I’m sponsoring his away shirt, and Jan Vojacek, because I want him to stay. Favourite away ground to visit: Is there more fun to be had anywhere than Methil? How many of the 40 other Scottish senior grounds have you visited? About a dozen. I conserve my travel budget (and my wife’s tolerance) for SHS. 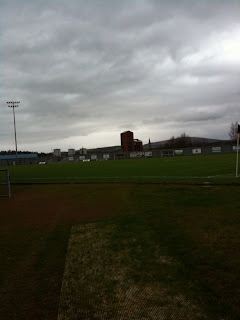 Strathclyde Homes Stadium or Boghead Park? Boghead will live in my heart forever (and needs a plaque on that housing estate), but I’ve come to love the Rock. It’s the most picturesque ground setting in the country. A feature you would like to see added to the Strathclyde Homes Stadium: Many more additional home fans… and Community Suite bar access for visiting supporters. (1) For those who might not know, Owen Coyle started his professional playing career at Dumbarton, scoring 36 goals in 103 appearances with the Sons between 1985 and 1988. His two brothers also appeared for us. Obviously this was written before Owen switched to Bolton. I still hope Burnley survive. Fantastic result at SHS today! After looking vulnerable at the back and going behind on the half hour, Dumbarton fought on to secure a much needed 2-1 win over Division Two league leaders Cowdenbeath. If Brechin had dropped a couple of unlikely points against Clyde, we'd only be two points off the play-off zone. In fact it's still four. Even so, it's that end of the table Sons are contemplating now, with Arbroath and the Bully Wee increasingly looking isolated at ground zero. However, I gather it was a far from flawless performance, before victory was gained through a bundled effort from Ross Clark a minute off the 90, adding to Roddy Hunter's 65th minute equaliser. Points on the road at Peterhead and East Fife are now important if we're not to slip back again. Sons' four postponed fixtures, at home to Alloa and Stenhousemuir and away to Clyde and Brechin, are due to be re-scheduled soon. They will make March a busy month for Dumbarton, and perhaps an opportunity for me to nab several games in one go with a trip to Scotland combining work and pleasure. Having moved recently to the West Midlands, I've been mulling where I might watch some football in between saving for trips to Dumbarton. I doubt that I'll be a regular anywhere, mind. But I do get itchy without live games. TV just isn't the same. 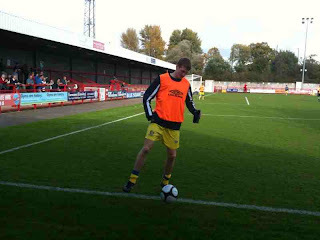 In Exeter I was spoiled by being only a 20-minute walk from the Grecians' ground and being able to buy walk-up tickets. In Birmingham it's a bit more tricky if you don't run a car. I'll visit the Blues at some point, for sure. Eck is doing a great job. Birmingham City are three miles away from my house. That's about 50 minutes if I fancy a brisk walk, or a shortish bus trip. Aston Villa are six miles out and slightly less accessible. Wolves are tempting, too. They play in similar colours to the Sons, after all! Getting there is not complicated, but it's still a ten minute walk, 25 minutes on the bus, 23 minutes on the train and another 15 minute walk, plus transport waiting times. That amounts to the best part of a three-hour round trip. The side I'd be most inclined to see from time-to-time are Coventry City, for whom I've had sympathetic feelings over the years. I went to Highfield Road a couple of times in the '80s, but the new Ricoh Arena (pictured) looks a pain to get to. It has to be said that the Sky Blues have excellent ticketing arrangements and reasonable prices, but the link on their website to match day buses is broken, and when you search their are no details. Besides, even after I've got to Coventry station (walk, bus, train) it's another two buses or a bus and a walk, and plenty of queuing after the game, I'll wager. The official arena site just advises a taxi -- though on a match day that would be a fair bit more than their optimistic £8+. Still, I'm tempted by the visit of Nottingham Forest to Coventry on Tuesday 9 February... and let's face it, if this was all it took to get to see Dumbarton regularly I'd be absolutely delighted! But that's the difference between supporting a team and just enjoying a game. Well, it's gone midnight and the dreaded words "pitch inspection" have not appeared on the Dumbarton website, so hopefully football for a new year and a new decade will finally take off with the visit of SFL Division Two leaders Cowdenbeath to the Strathclyde Homes Stadium at 3pm today. The Blue Brazil were of course rivals to the Sons in our Third Division championship season, and took an early lead in 2008-9 before finally burning out. They lost out to Stenhousemuir in the play-off, but then surprisingly secured promotion by virtue (if that is the right word) of Livingston's relegation to the third tier due to financial difficulties. No-one can say that they haven't taken advantage of the situation, however. Right now the Blues are 13 points in front of DFC, and three points clear of early pacesetters Stirling Albion. A win for Sons this afternoon would be a boost in a number of ways. We lost 3-0 at home to Cowden in September and then 2-1 on the road in November, so this is an opportunity to redress the balance, to get 2010 off to a good start, and also to begin making a bid for the top half of the table. Fingers crossed. Both for the game going ahead and for the result. Oh yes, there will be a 12-page wrap-around programme for this fixture, which includes the double Christmas issue for the games against Alloa and Stenhousemuir (both postponed). I have a column in the latter, ironically entitled Seeking a bit of festive cheer, but not in the abbreviated Cowden one. There's also a 'Fan of the Week' feature, which I'll pop up here on Sunday, assuming everything goes to plan. West Bromwich Albion players had DEC Haiti Appeal emblazoned across their chests during the league match against Newcastle United on Monday 18 January. Baggies chair Jeremy Peace said the club felt it was an opportunity to play a part in helping to raise cash. Up to 200,000 people may have died in the earthquake but the full figure is not known. The 18 shirts worn by the West Brom squad will now be auctioned off after the match to raise more funds. (Via the BBC) Hopefully other teams will find ways of pitching in to this vital cause, if you'll pardon the lamentable pun. Unfortunately I wasn't one of the 8,549 people who packed St James Park this afternoon to see Exeter City secure a thrilling 2-0 win against League One leaders Leeds United, having moved to Birmingham earlier this month -- but I can imagine the ecstasy. And for once my anticipatory powers proved right in the programme note I supplied, More memories in the making. There I wrote: "The bookies have most of their money on new-look Leeds today, and the pundits say Exeter should be happy with a point. But that underestimates the determination of Paul Tisdale’s side... who will be straining every muscle to make this a truly memorable match for all the right (red and white) reasons." OK, not an outright prediction of victory, but a good nod in that direction. The Grecians have thrown away a number of games they should have claimed this season, so sooner or later they had a favourable upset coming their way, according to the lottery inclinations of football. It's one of the things that makes the game so compelling. Optimism earlier in the week that Dumbarton would finally get a match in 2010 away at Brechin City today (albeit a bounce game) were thwarted by the confirmation of a waterlogged pitch at the 9am inspection at Glebe Park. And no-one sane would put any money on Strathclyde Homes Stadium hosting Cowdenbeath next weekend, either. With the following Saturday away at Peterhead (ouch!) and a fun day at Methil to follow, this means that Sons may not get a home match in the New Year before 13 February with Stirling Albion... and even then. Well, I'm next due up on 20 February as a ball sponsor for the Clyde clash. But when exactly to book the rail ticket is an interesting conundrum. I don't fancy three trips in a row with no game, but leave it too late and the fare will cost a fortune. The pic is from the postponed match on 19 December, incidentally. Ah well, let's get things into real perspective. It's a miserable (and costly) time for Dumbarton Football Club, it's players, officials and supporters. But when you watch the horror unfolding in Haiti (where my wife did a humanitarian stint in her student days) any moaning about the impact of our weather seems entirely misplaced. So fingers crossed for the Sons... but cash out for the earthquake victims. Donations to the Disasters Emergency Committee can be made here: http://www.dec.org.uk/ If you have a mobile, text GIVE to 70077 and a £5 donation will be made to Haiti relief. There is little doubt that today’s encounter with Leeds United at St James Park will be, for many Exeter City fans, ‘the big one’ as far as home games go this season. Anticipation has been heightened further by Leeds’ magnificent FA Cup victory at Old Trafford on 3rd January, recalling the Grecians’ own heroics against Manchester United a few years ago. While fans of the Peacocks (to give Leeds their traditional nickname) still like to sing, with tongues firmly in cheeks, “We’re not famous any more!”, the ‘brand recognition’ for the club nevertheless remains high, not just in Britain but across Europe. So Whites’ supporters holidaying in Italy, Spain and Germany still find themselves in long, nostalgic conversations about past glories with fellow aficionados of the Beautiful Game. And that’s before anyone gets on to the subject of Brian Clough’s notorious 44 days at Elland Road and the side’s consequent appearance last year in a fine football film, ‘The Damned United’, starring Michael Sheen. This big screen cameo was admittedly a bit of a mixed blessing, as it highlighted aspects of the all-conquering 1970s Leeds side that earned them the dislike of some football followers, as well as undeniable respect. Cloughie said at the time that Don Revie’s warriors should be relegated to the second division. In the event, they went one better! But that’s all history. If their current formbook is anything to go by, Leeds will almost certainly be playing Championship football next season, deservedly so. Few would doubt that their challenge to get back into the Premier League will then be swift and substantial – buttressed by a huge supporter base in West Yorkshire and beyond, as well as by fans willing to travel far and wide to show their loyalty… as we are witnessing in the southwest this weekend, wild weather permitting. For those of us in our 40s, 50s and beyond, the thought that Leeds have ended up playing in the third level of English professional football for the first time in their history is still hard to credit. Their fall from grace over the past decade was startling. Remember that United were only ejected from the top flight in the 2003-4 season, after 14 years there and an illustrious history stretching back many years before. Indeed, not long after the turn of the Millennium, the men from Elland Road were appearing in a major European semi-final and planning yet another assault on the Premiership title. It was economic folly that was their undoing – spending massively beyond their capacity, and mortgaging huge borrowing on TV rights and income from a qualification place for the Champions League that did not materialise. At that point the Leeds slide began in earnest, serving as a definitive lesson about the perils of gambling with big money in modern football – a financial warning which many clubs have sadly failed to heed, as the current lamentable mess at Portsmouth illustrates. Exeter City have suffered their own problems with mismanagement in the past, too. But now the Grecians are on a path towards sustainability at a respectable level within the Football League, and this afternoon’s match is both a marker of the huge distance travelled since the bad old days of relegation, near non-existence and non-league obscurity. It also provides an opportunity for us to judge the level City have now attained, and how far they have to go to negotiate the next step up. Meanwhile, as the current Peacocks strut their stuff in Devon – mindful of the tough game that Exeter gave them up North during their narrow 2-1 win on 8th August, no doubt – many Grecians fans will have their own recollections of the Leeds of old. Mine go back to 2nd December 1972, and an away clash with Arsenal at Highbury. Those were the days when you could get a walk up ticket for a clash of the titans if you were lucky, and I spent the afternoon with two schoolmates who were Gunners fans watching 22 players who are now all legends. That day Leeds consisted of Harvey, Reaney, Cherry, Bremner, Madeley, Hunter, Lorimer, Clark, Jones, Bates and Yorath – and they still managed to lose by the odd goal in three! The bookies have most of their money on new-look Leeds today, and the pundits say Exeter should be happy with a point. But that underestimates the determination of Paul Tisdale’s side, now without Danny Seabourne, who will be straining every muscle to make this a truly memorable match for all the right (red and white) reasons. After a not terribly inspiring first half, and Liverpool going in one up after a rather fortuitous own-goal in their favour from Ryan Bertrand, second tier Reading fought back tenaciously to rob the Reds of a place in the fourth round of the FA Cup, winning 2-1 in extra time. Midway through the second period the game suddenly became electrifying. Indeed, on the 79th minute it nearly produced the goal of the season so far. The Royals' Jobi McAnuff ran through the entire Liverpool midfield with a series of exquisite touches, only to miscalculate his final move in the box -- aiming to place the ball to the right of Cavalieri, rather than to chip the 'keeper. That moment alone merited their last minute equaliser from the spot by Gylfi Sigurdsson, after Yossi Benayoun was adjudged (perhaps slightly harshly) to have challenged Shane Long unfairly. To their immense credit, Reading came out fighting again in extra time, not simply sitting back for a penalty shoot out. In the last 50 minutes of the match they played with commitment and, sometimes, verve. Liverpool, meanwhile, looked a pale imitation of themselves, especially when bereft of Steven Gerrard and Fernando Torres. Reading's winner from Shane Long's close range header was well-worked and well-taken. From then on it was a tense scrap to the finishing line. In summary, a fantastic victory for the lower league club. Liverpool look disconsolate at the end: out of the two cup competitions, out of the Champions League, out of the Premier League title race... and probably struggling to beat Manchester City to that crucial fourth CL qualifying place too. There will be those baying for Rafa Benitez's head tomorrow, though Reds fans are generally more level headed than many. But the problems on the pitch mirror much deeper seated difficulties in the boardroom, arising from the debt loaded onto the club by its absent owners. Picking up the pieces is going to be very difficult. And the idea that another manager can wave a magic wand at this stage of the season is deluded. That doesn't mean it won't happen, of course. This is football. As expected, another raft of games has been called off across Britain this weekend, as a result of one of the coldest weather snaps in recent memory. But football has frequently had to deal with extreme conditions. 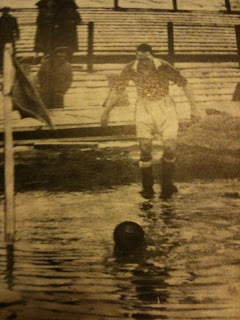 Perhaps my favourite illustration of this is the famous photo from Dens Park in 1936, with Tommy Robertson pluckily preparing to take a corner for Dundee in what to all intents and purposes looks like a swimming pool! This is just a detail. In the original you can see that few of the supporters even have umbrellas, and there's not a white line in sight. Of course there's no way a match would go ahead in anything like these conditions today. The mud baths of the 1960s and 1970s, when I grew up with the game, are also a thing of the past -- and rightly so. It often turned to farce. However, I have some sympathy with Arsene Wenger's recent complaints about us becoming an obsessively risk-averse society these days. But it's too easy to blame 'health and safety' indiscriminately, as football fans frequently do. 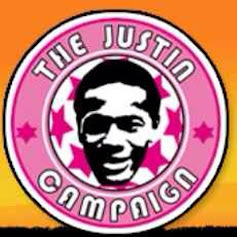 It is legislation furthered by litigation, and by a litany of abuses, which has led us to err heavily on the side of caution (as when teams with under soil heating still have to postpone matches because of conditions around the ground and their duty of care towards supporters). Maybe it does feel as if we have to go too far sometimes. But when that is the case it's often the result of over-zealous or unintelligent interpretations of the rules, rather than the rules themselves. The HSE also regularly responds to errors and misrepresentations about these issues in the tabloid media. Their prime role (and an important one, given our industrial history) is to prevent death, injury and avoidable ill-health to those at work and those affected by work activities. People moan about the restrictions and regulations, but if they slip and fall on the ice they may still look for the number of a personal injury lawyer to see if someone else can be made responsible. That's where the real contradiction lies. Intrepid Exeter City fans who made the trek from the southwest to Norwich yesterday had to sit it out on the A3 after the winter weather bit hard again. Unfortunately they were not rewarded with any points. But by all accounts the Grecians gave a better account of themselves than the 3-1 scoreline suggests, as a Canaries fan was gracious enough to point out on Exeweb. The problem at the moment is that results are just not matching performances. In League One mistakes (such as those made by 'keeper Paul Jones for the first and third Norwich goals) are readily punished, and City still seem to lack penetration up front. Relying on Richard Logan as a 'super sub' is not enough. The consolation this time was an 81st-minute goal from veteran Marcus Stewart (picture), who has taken some unfair stick this season, incidentally. Exeter are now poised perilously, just two points clear of the relegation zone, with Oldham, Brighton, Leyton Orient and Tranmere all holding one of two games in hand. The run through to March will be critical, therefore. Good luck to Blue Square Premier heroes Barrow, who take on Sunderland at the Stadium of Light in the FA Cup today. My namesakes have had a great season so far. 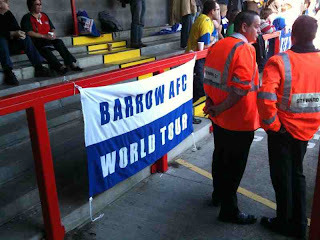 I caught them on a good day out at Crawley Town earlier in the season, where this picture was snapped. One of their most redoubtable cheerleaders is a guy from Aberdeen who now lives in Barrow and splits his loyalty with the Dons. When the Bluebirds came up from the Conference North the year before last the big question was whether they could survive. Last term was tricky but ultimately successful on that front. This time they are looking stronger, though getting into the top half of the table and eventually competing for promotion back to the League will be a big challenge. Another year of stability, augmented by a good cup run, would be a solid achievement for the boys from Holker Street -- which is a dire ground to get to by public transport when you live where I do. But I hope to make it again one day. Well, happy New Year to one and all! Sadly, it will be a football free beginning to 2010 (and the new decade, if you are so inclined) for Dumbarton this weekend. 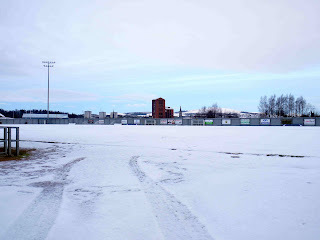 The calling off of the match against Stenhousemuir follows recent weather-induced postponements against Alloa Athletic (home) and Clyde (away). So this glorious Winter scene is in fact Strathclyde Homes Stadium at the moment -- or at least, SHS as it was when the pitch was last checked. Thanks to Robert Ryan, from whom I nabbed an otherwise pleasing image. He's a regular source of entertainment and wisdom on more than just fitba', by the way. Anyway, let's hope we're back in action again soon; and back to winning ways. Meanwhile, attention is bound to be focussed on the January sales. Sons manager Jim Chapman has been pretty active in the marketplace since his appointment, and I imagine 2010 will be no different. The economics of the game (let alone DFC) are going to make it a tough winter in more than climatic terms, however.